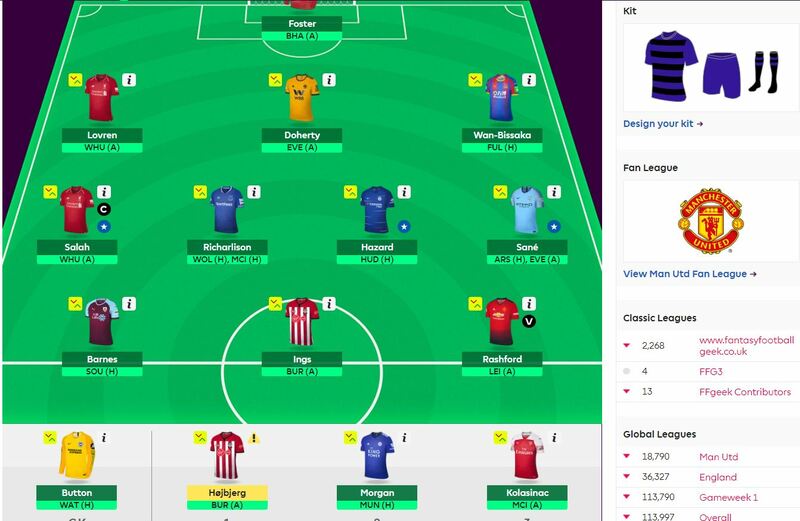 Here’s our fantasy premier league teams GW25 article where we give our early thoughts on the FFGeek team for GW25. We look back at gameweek 24, The team planning schedule, transfer thoughts plus early captain thinking. A poor week with a 12k red arrow when most people experienced greens. An OR drop to 113k OR. 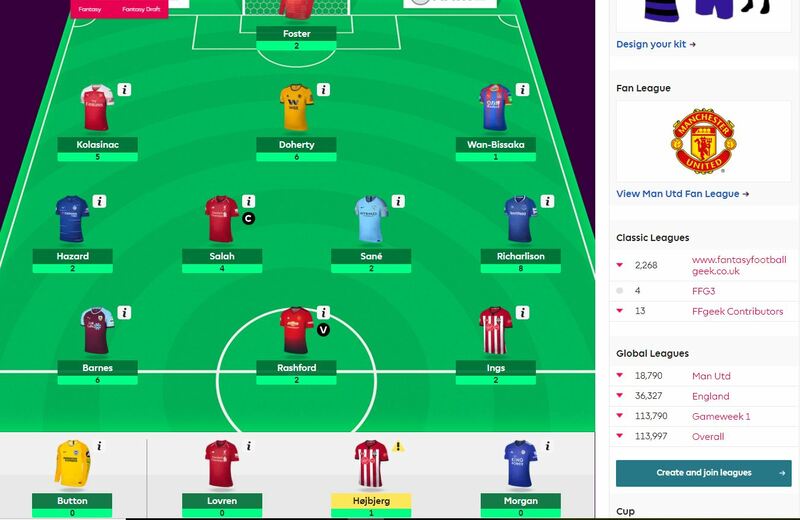 I was lucky it wasn’t worse as at the end of Wednesdays games I was 132k OR and Lovren not playing luckily meant Barnes’ 6 points came off the bench. It was another week where again the template killed me and my differentials didn’t do enough to make up for it. The Template players I have are Doherty, Wan Bissaka, Salah, Richarlison and Rashford. 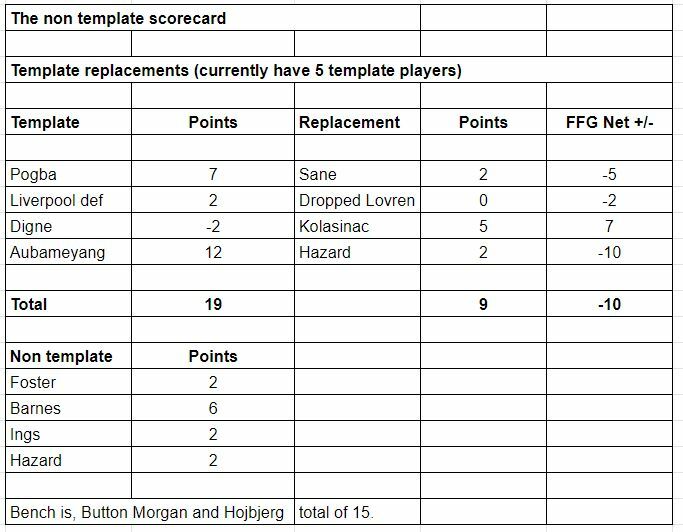 So the main template battle lost was Aubameyang vs Hazard where Hazard unbelievably has blanked for the 5th consecutive game and put out his 4th out of the last 5 pathetic set of underlying stats up. Yesterday had some volume of shots and key passes but all low chances of returns. He has Huddersfield at home next and after that he will be gone given he will have Man City and then a blank gameweek in GW27. I thought I might get an unlikely clean sheet from Foster which went with 2 goals in the after the 80th minute. Ings also with a blank in a decent fixture was disappointing although his underlying stats were just about ok at least. So assuming I do those transfers I have 3 double gameweek players in Aguero, Sane and Richarlison. Of the template replacements the Burnley defence vs the Liverpool defence is a total mismatch. Sane with 2 games (1 probably from the bench) vs Pogba at Leicester looks an OK bet. I’m not totally decided on it and I could just leave Aguero and make 1 transfer and then do 2 next week when I take out Hazard which would leave me with cash to do pretty much whatever I want to. It just depends on how much I want Aguero for this double gameweek. I haven’t decided what I’m going to do yet but will tomorrow at some stage. If you haven’t seen my latest article on the blanks and doubles then here’s the link. So my priority at the moment is to sort out the 2 blanks as I’m thinking I will use chips (either free hit or wildcard) to deal with the doubles. The 5 teams with fixtures guaranteed in both GW31 and GW33 are Bournemouth, Burnley, Huddersfield, Leicester and Liverpool. You can see in the planner how I’m thinking about how I could get there. Following that line would give me 9 players in BGW31. No problem deciding on who to bench. The 3 of Hojbjerg, Kolasinac and Morgan are pretty obvious. Here’s how the team lines up at the moment. Ings is either Aguero or himself depending on whether I do the transfer. Lovren will be transferred for someone who will start come what may. Any thoughts on Danilo as a cheap Digne replacement / DGW punt? 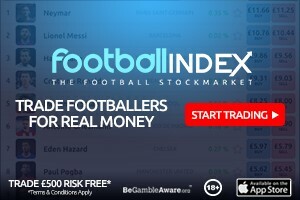 Having seen it now….Am leaning towards Ederson considering Fabianski has Liverpool..
Hi Geek, I’d be interested to hear why you have plumped for Kun and what you think on the game time prospects for Kun versus Sterling and Sane. All three started on Tuesday and only Kun played in the League & FA cup games before. So do we think Kun is due a rest, or Kun is less likely to be rested?! I think with Kun missing a couple of games a couple of weeks ago that he isn’t necessarily due a rest. With regards the blank game weeks, Wolves being knocked out before the quarters would be an ideal situation for the blank GW31… as this would mean Wolves V Arsenal would go ahead, making manouevering that GW without a chip very easy. Geek et al., I suppose (even if u have to take a hit) it will be a gobbledegookly gargantuan gamble not to captain him leave aside not picking him up…. Have brought in Aguero for Auba (and Boruc for Button to give 0.1 I needed)… Think it makes sense but am fearful of the Pep roulette!